Plundering the Romance Novel, very honestly subtitled – A really awful, truly terrible, very, very, bad romance – is a delight to read, enjoy, and being a parody take none too seriously. Check out the catchy quote on the cover too – excellent! Our hero, Stormy Raven Steel Vanderbilt Von Devreaux, Captain V.D. 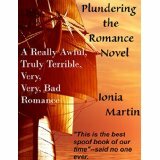 for short, is taken aback when the (obviously stunningly beautiful) woman aboard his pirate ship is not behaving as he expected from all he had read in the romance heroine handbook. Rather than being aloof and appearing not to be interested in him she is actually flirting and denying him his conquest…and that is just the start. Whichever bit I chose can’t do justice to the humour that runs throughout this short and entertaining book that I really enjoyed. Chapters 4-6 and 11-12 are inspired and after the epilogue you of course get a peek at the sequel which is of course completely different from this book. To find out much, much more click on a link…. Great review for a book I also absolutely loved and laughed through! Thanks Barb – I think it was your post that made me get this in the first place, so thank you – just goes to show how these things work!! You’ve gone and made my whole week! I see I have reviews to catch up on 🙂 thank you! Oh I’m pleased about that! Glad you liked it. I’ve just realised I haven’t added it to Goodreads yet but I will soon.